Future users could compare the prices and features of competing carriers and service plans directly on their iPhone, bypassing the need to deal directly with service providers, a new Apple filing shows. The concept is detailed in a new patent application published this week by the U.S. Patent and Trademark Office entitled "Method and Apparatus for Using a Wireless Communication Device with Multiple Service Providers." 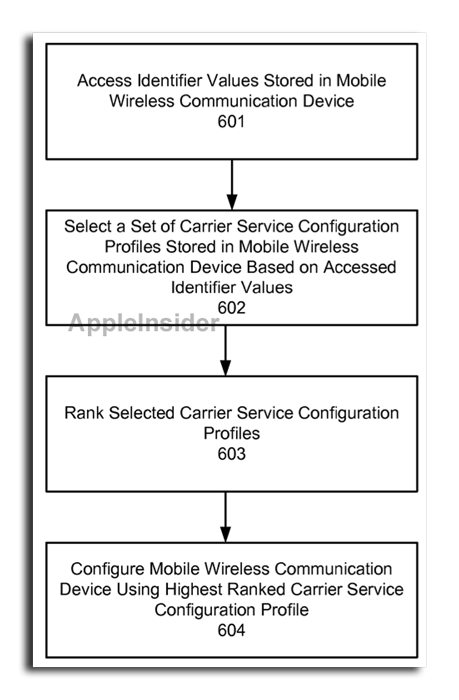 Discovered by AppleInsider, the proposed invention would have a set of stores carrier service configuration profiles available on an iPhone. 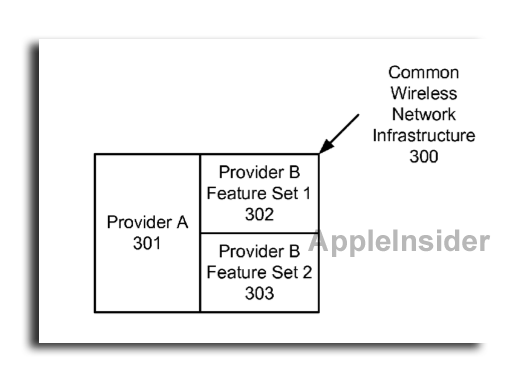 Based on a user's needs, Apple's system could assign a priority ranking to carriers and their respective configuration profiles, allowing users to easily find a plan and provider that are right for them. Last year, Apple was rumored to be exploring this very concept, as the company was said to be developing a new open SIM standard that would make an iPhone capable of working with multiple carriers. Such a move would allow users to shop for mobile service directly from Apple's handset. Apple's interest in this outraged some carriers, who felt the method would marginalize their role in courting customers. Carriers in Europe subsequently threatened to cut subsidies for the iPhone if Apple pursued those plans. The new patent filing would seem to confirm those rumors, detailing how such a concept might work on a so-called "world phone" capable of operating on multiple carriers with an open SIM card standard. In the document, Apple notes that handset manufacturers must currently ship multiple versions of the same device, with each customized for a particular wireless service provider. Apple would prefer to be able to distribute generic versions of the iPhone throughout the world, compatible with nearly all carriers. In addition to flexibility for Apple, the concept would also allow greater choice for the consumer. The filing explains that some users may prefer to use the same mobile device at different times with different wireless service providers. Apple's solution is a "customized user experience" created automatically, with the combination of compatible hardware and software allowing users to seamlessly switch carriers without the need to buy a new phone or obtain a new SIM card. The proposed invention, made public this week, was first filed in April of 2010. It is credited to Robert Kukuchka, Shuvo Chatterjee, Arun Godfrey Mathias, and Matthew Klahn.